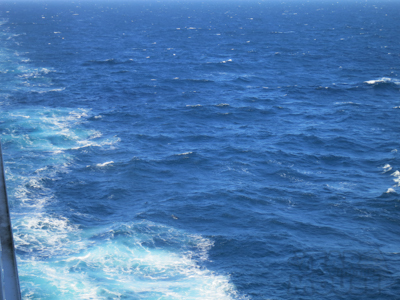 Day 2 was a sea day and I’ll be honest, I think sea days are the best part of any cruise. 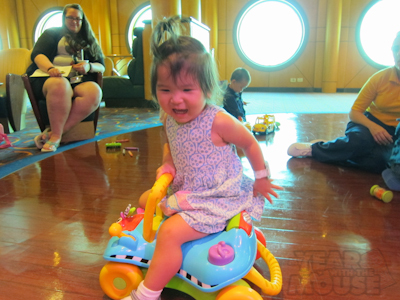 Seriously, I’m there to enjoy the boat, and there’s SO much to enjoy on a Disney cruise. I’ve heard of people who don’t even get off at port, and honestly I don’t blame them. Kevin and Theo headed off to the pool. It has to be pretty warm for me to get in the water–any water, anywhere, but Kevin is much more willing to brave the cold so off they went. Good thing too, Theo has consistently said that one of his favorite parts of the cruises was the water slide. And the other nice thing about swimming in the cold? Barely any lines. He went down the thing like a million times. Violet and I headed to Toddler Time in one of the lounges. I wasn’t sure what to expect but I was delighted when I got there. 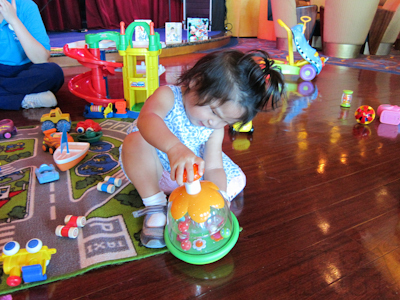 Basically the nursery staff brought out a big bunch of toddler toys and it was open playtime. They had coloring sheets but Violet was much more interested in the toys. 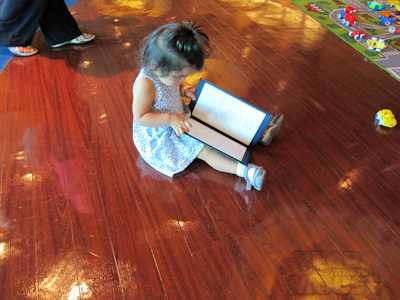 But she LOVED the bar menu. Girl after my own heart! So of course I grabbed my camera and headed straight out to the balcony. Then the neighbors apologized for making a ruckus but pointed out that there was a whole pod of dolphins swimming in the ship’s wake. It was awesome! I couldn’t believe what we were seeing! I double-wrapped the camera strap around my wrist and tried to take a picture. I SWEAR there’s a dolphin in this picture. Actually he (she?) 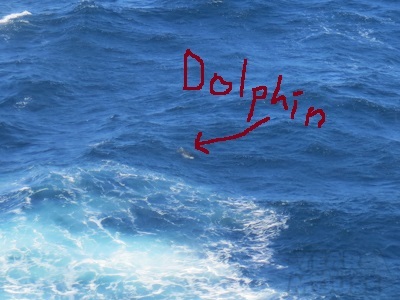 kind of looks like a shark in that picture but I swear, you could tell it was a dolphin in person. Also, do you like my classy graphics work? Yeah, I probably could have done something in Photoshop but Paint is much easier and quicker for a non-Photoshop person like me. After the nap we saw a show. Naturally I took no pictures and cannot remember which one it was, but the kids liked it. The shows are great onboard, really professional-quality. There are two seatings for dinner, the early one at 5:45 with a lot of kids because it’s closer to most people’s normal dinners, except for us, and the 8:15 seating which is what we chose, where there tends to be fewer kids. 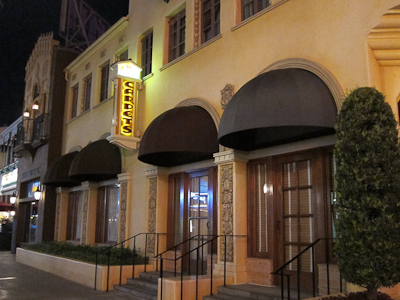 If you have the early seating, the show is after dinner, if you have the early sitting, the show is before dinner. Two shows, don’t try to work out the fuzzy math. It was semi-formal night for dinner, but since I love dressing up we made it formal. Unfortunately this turned into a HUGE battle with Theo who refused to wear the bow tie from his tux (tux purchased on ebay for $35). There was a significant amount of crying and pouting and frustration on all sides until we all compromised on the vest that matched Violet’s dress but not the bow tie. We stopped by the photographer hoping to get a good family picture, maybe for the Christmas card. Hahahahahaha! Family pictures, so elusive! 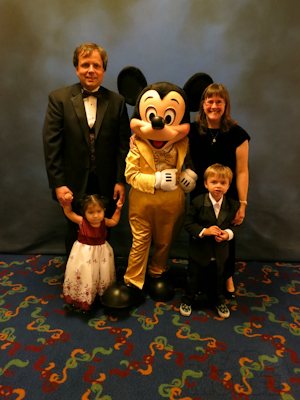 Wait, that must have been the Golden Mickeys show because Mickey is wearing his Golden Mickey outfit. If that’s the case, we didn’t go to that show. I have no idea what we did. Sorry. 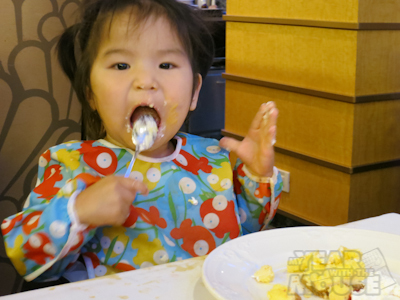 However, dinner perked up considerably after Theo had a bite to eat, and especially when he got his dessert. 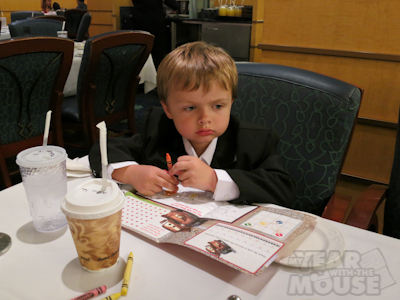 Every night, he ordered plain vanilla ice cream with Mickey sprinkles. It was pretty much the best dessert EVER. In fact, he missed it so much the night they ate at the kid’s club (Pirate Night) he was totally bummed he didn’t get it. But more on that later. 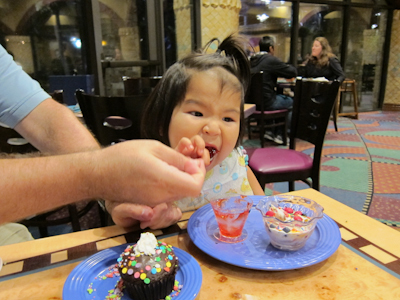 Violet was also a fan of dessert. I highly recommend bringing along waterproof long-sleeved bibs. They saved many dresses and made for easy cleanup! 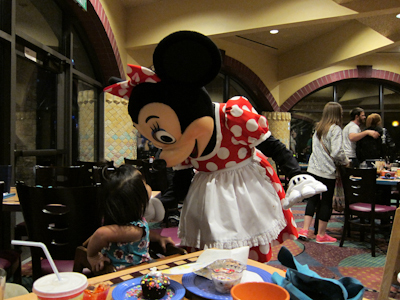 Yesterday in Part 1 I explained why we were at Goofy’s Kitchen and the different characters we saw there. So, uh, go read it, okay? 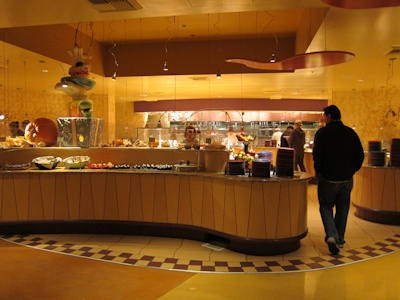 Goofy’s Kitchen is a buffet style restaurant, a fact that I completely forgot about when they seated us and failed to hand us a menu. 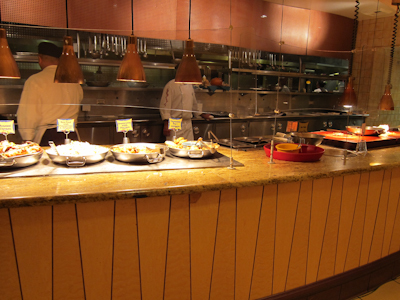 I was like “Hm, where’s the menu” before looking directly to my right and seeing the buffet. That I had just walked past. I’m telling you, two kids have done this to me. I no longer have the brain I had like years ago. But then again, who does? The very first thing I saw was the dessert island. Of course I had Theo with me and this is what he made a beeline for. 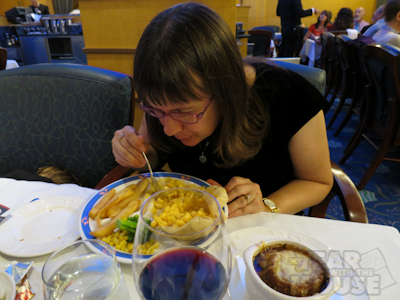 I had to repeatedly remind him that we were eating dinner first, and I wanted to check everything else. I’ll be honest, I’m not a salad kind of person most of the time. I’m not sure why these pictures turned out so yellow. The lighting? Who knows. As a general rule, if you’re new to My Year With The Mouse, I take notoriously mediocre photography, so lower your expectations. This is for information and humor purposes only. 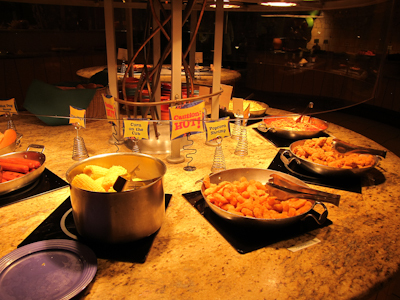 Anyway, there’s what I called the “kid food station” with things like mac and cheese, spaghetti and meatballs, chicken nuggets, mac and cheese, and mac and cheese. 3 guesses as to what my kid ate. 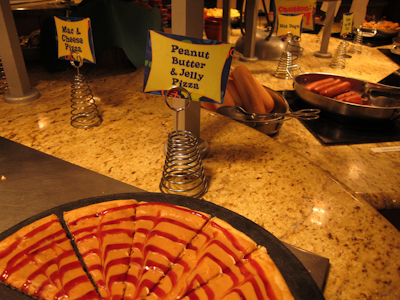 There’s also pizza including Goofy’s Kitchen famous PB&J pizza. I actually really love this stuff. There’s something about melted peanut butter that gets me every time, and on a pizza? Genius. 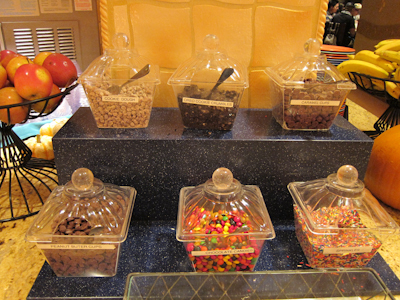 They have this at both the brunch and the dinner. Brunch? Dinner? Go for it. Oh, and mac and cheese pizza next to it, but my kid just went for the straight up mac and cheese, because that’s the way he rolls, yo. 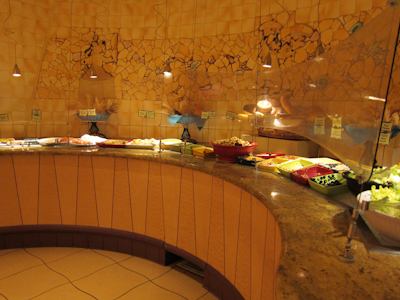 There’s also a carving station and other adult foods for the non-mac and cheese crowd. 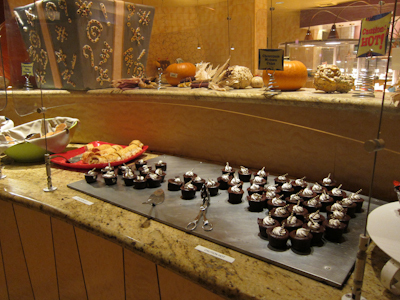 And then the desserts. Oh, the desserts. Almost as good as my favorite meal, breakfast. 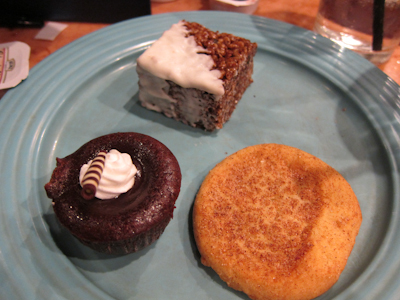 I opted for a delicious looking trio–the molten lava cake, a krispie treat, and a snickerdoodle. I’m telling you people, it was the best dessert in the house. 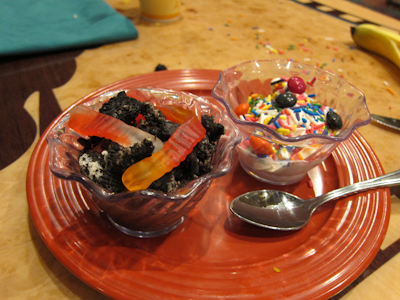 Theo went for the pudding with oreos and gummy worms as well as some ice cream. 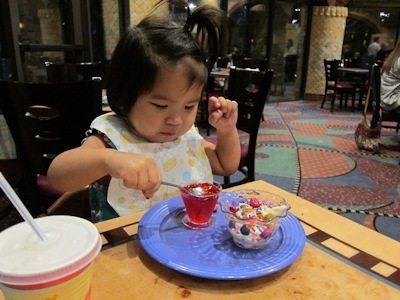 Then he declared he only wanted the gummy worms from the pudding and just ate the ice cream. We had also mentioned when we arrived that we were celebrating an Adoption Day. 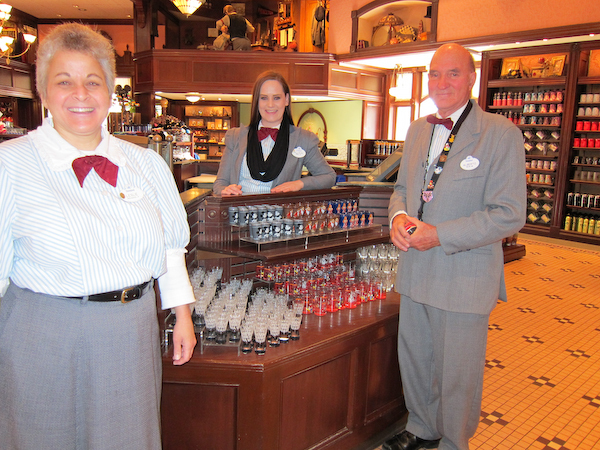 The cast members were so excited for us. 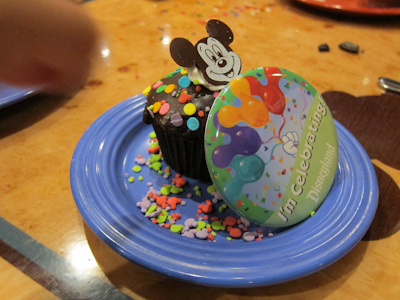 They brought us a cupcake with an “I’m Celebrating” button. 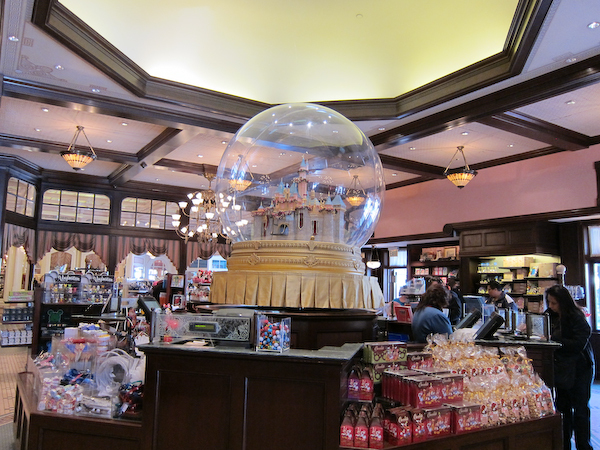 And here’s one thing I love about Disney–they never make any assumptions about your family. In our family, Kevin and I are white, Theo is our biological son and is basically a carbon copy of his father, like a total mini-me, and Violet is, obviously, Asian. 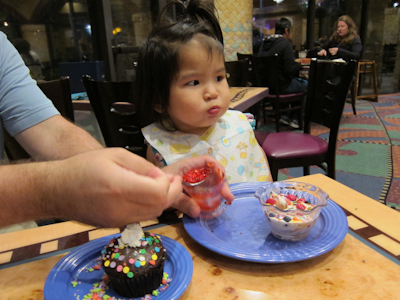 So what did our server cheerfully say when he brought the cupcake? Is that a “no, duh?” question? NO! As an adoptive family I can tell you–any one of us including the adults could have been the adoptee. 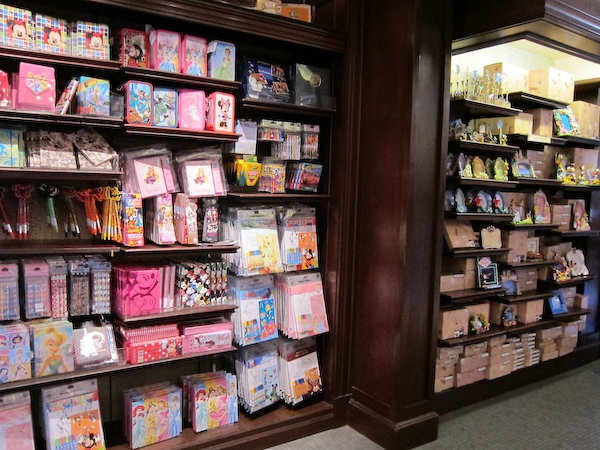 I really, really appreciate the way that Disney doesn’t judge anyone based on appearances. It would have been really awkward if he’d just plunked it down in front of Violet and it had turned out we were celebrating Kevin’s day or whatever. And another cool thing? As soon as he saw the cupcake, Theo said, “I want one too!” (yep, we’re at that jealousy age) and without batting an eye our server turned around and brought him one too, complete with button. 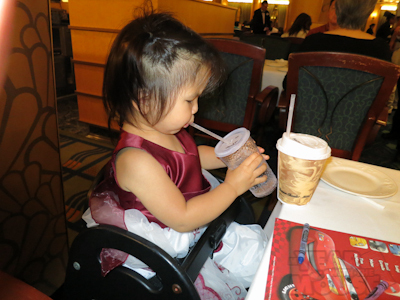 All in all, it was a fantastic way to spend our Violet Day dinner. And I posted this before, but this was the best part of all. 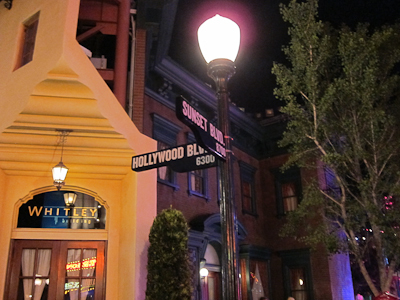 Hollywood Land is now much more highlighted since the Buena Vista Street walls came down. 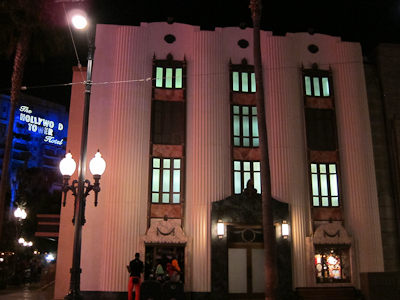 It starts with the Carthay Circle theater and ends over with the Tower of Terror. In between are some great buildings and details. 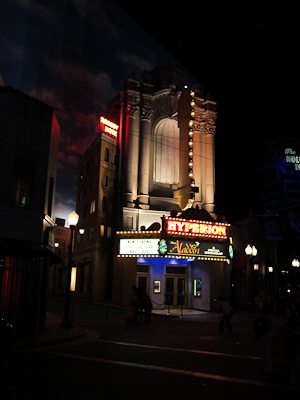 The Hyperion is where you can find Aladdin. 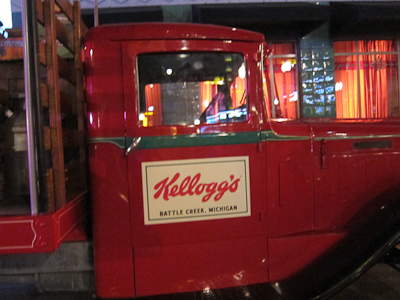 Battle Creek, Michigan–the cereal capital of the world! 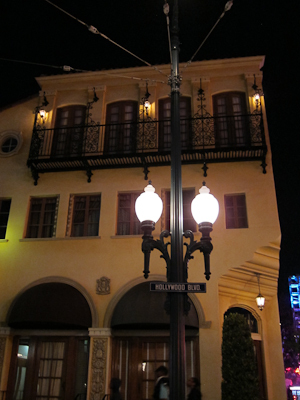 The cable lines above the street were cause for much consternation among the rabid Disneyland fan community. Many people thought they looked ugly. 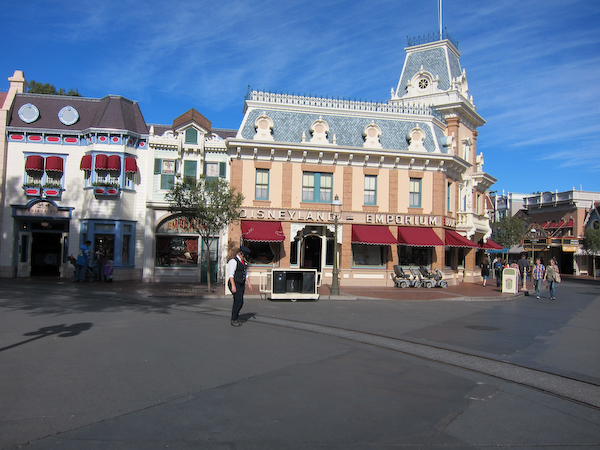 But they are completely historically accurate to the time period of Buena Vista Street, and the Red Car Trolley would look very weird without them. 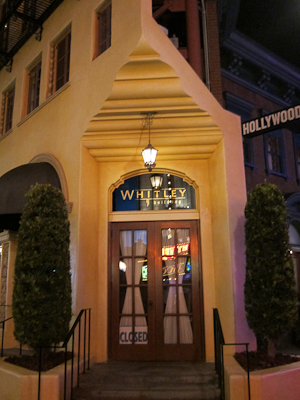 Even the doorways and awnings look sharp. 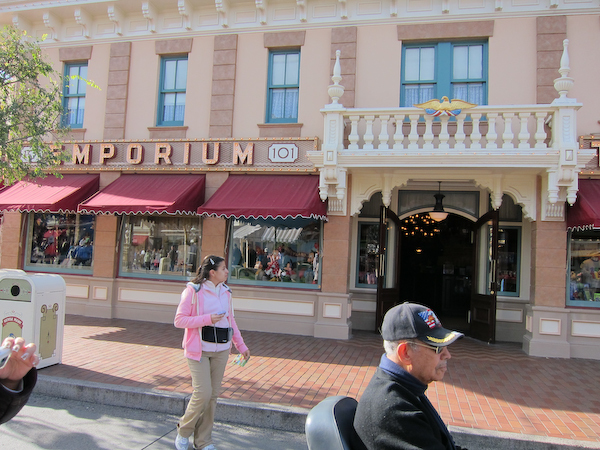 And for real, how cool would it be to have an apartment inside Disneyland? I bet people would pay a TON of money for that. Everyone else is on holiday break, right? MYWTM is taking a few days off before the new year (or as Theo calls it, the “new ears”). Enjoy some classic MYWTM entries!